Actionable insights are top of mind for an overwhelming majority of companies today. As with a lot of popular buzzwords, the meaning of “actionable insight” isn’t always entirely clear. 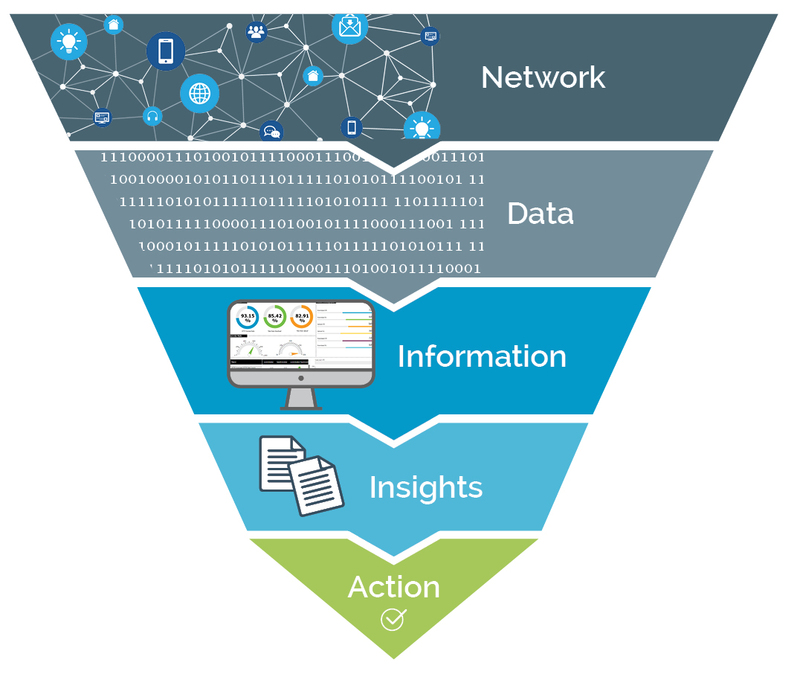 The data-driven digital economy is built on analytics. But that foundation, like the data it’s composed of, is only useful if you implement it properly. The key funneling sequence sounds simple, but it takes a lot of intelligent behind-the-scenes application activity to get it done: 1. Gathering data. 2. Sorting, filtering, and sifting information to understand what you need to do next. 3. Considering possible courses of business action. 4. Taking action. We start where your data is, right in the middle of the network. There is a massive amount of data crisscrossing through your network in all directions, and it’s changing every second. Our probes quietly and non-intrusively mirror the data and store it in unprocessed chunks for your later filtering. These raw blocks of numbers and text contain a lot of knowledge about your business, your network, and your customers, but the data isn’t usable in that state. It needs translation into human language, and organization into functional sets. Think of the data refinement process as an assembly line. We take the raw data pulled in from your network and feed it into our processing and aggregating engines. There, we refine it, filter it, pour it into usable forms, polish and tune the resulting components, and assemble them in various customized configurations. What rolls off the line is finely-tuned intelligence built to serve your business needs: it’s the information you need to know now. Deploy our solution on complex missions for users in each of your departments, and watch our virtual brainpower exercise some muscle. Say for example you’d like to know your subscribers’ download rates, or what the service quality level is looking like for your inbound roamers. That’s all there for you to see, and you can drill down for details as needed. You can also organize and visualize the information in a wide variety of formats, in whatever way is most efficient and appealing to you. RADCOM provides the insights you need, based on your company’s sorted and processed information. Once the data has been clarified and codified by our back end algorithms and presented as intelligent information via our front end interface, you’ll take the emerging customized analyses and get ready to make some effective business decisions. These are real, current insights into your system, network, subscribers and overall operations that offer you an opportunity to act. Now, consider how you’ll want to use the insights we’ve revealed to create a better experience for your valuable subscribers. Think about subscriber billing and plan usage insights as one example. If you have insights into who your subscribers are, and you’re aware of their history, you’ll be ready to present them with the options that serve them best. Insights could be as simple as knowing which mobile phone model is most popular with subscribers in a given location, or they could be more complex and analytical, projecting currently trending information for future time frames, and extrapolating potential trajectories from the given information. They say it’s not what you know, it’s who you know. In telecom, the people you need to know best are your subscribers. So, take the insights we present and get going. Actionable insight + action = results. Once our insights help you find information that could potentially set up a winning move, you still get to make that call, taking it from actionable to action. One effective actionable insight tool for CSPs is a dynamic call driver solution. Tables based on CEM diagnostics show the possible reasons for a customer’s call, and potential solutions, in addition to other analytics information, with indications for the customer service representative as to which courses of action he might suggest. This allows for calmer subscribers, more informed and supportive representatives, shorter call times, and increased first call resolution, without the need to escalate to the next tier of service. Needless to say, it also makes the CSP look good. For example, a caller might be contacting customer care to complain about very slow browsing. This is the most common type of customer call. The first thing for CSP representatives to do is check the network. Does it seem like the cells are overloaded? If so, check the number of subscribers connected at the same time. One possible direct action to take in order to fix an overloaded cell: it may be advisable for the carrier to deploy temporary base stations during busy hours. It would also be a good idea to check the load balancing configuration, and check with the cell vendor what the max load is for that cell. What is the likely result for that cell if it is overloaded? Will the cell reject a subscriber’s request to connect? It’s important to find out. If the representative knows that the subscriber has gone over the bandwidth limit of their monthly or prepaid plan, they might propose upgrading the caller to a slightly higher data allowance, or to a premium unlimited data plan. This is advantageous for the subscriber, too, because raising their data limits may be quite inexpensive. Another viable solution for the same data overage problem could involve the customer care representative telling the subscriber which apps have been using the greatest amount of data. If it’s an app that auto-plays videos, for example, or downloads images by default, they may have options to turn that off, or delete it if they aren’t using it. That sounds like it’s an action for the subscriber to take, but it’s really one more valuable insight that can help customer care representatives take action. If the representative is viewing a RADCOM tool screen with available call driver solutions that won’t require escalation to engineering, that immediately pares down OPEX for the CSP. That’s also a quick and simple root cause resolution for the subscriber, which creates a positive touchpoint experience. These small, helpful interactions establish emotional satisfaction and loyalty in the subscriber, and that leads to reduced churn. You need actionable insights on an ongoing basis. With constant network traffic, the permanent quest to create a better customer experience, and an overwhelming rate of churn, you can’t afford not to keep up with your metrics. Use RADCOM’s tools for actionable insight to help you reach your goals.